North Carolina was an important part of the May 21-24, 2018 National Council on Aging Center for Healthy Aging Annual Meeting in Washington DC! Both Centralina and Piedmont Triad Area Agencies on Aging were represented in the conference presentations shared with participants from all over the United States. Laura Plunkett presented “Road to Diabetes Self-Management Education and Support (DSMES) Accreditation: Our Path, Successes and Challenges” while Annette Demeny co-facilitated “Achieving Medicare Reimbursement to Sustain CDSME Programs: A Road Worth Traveling”.To learn more from these presentations, please click on the images below to see the PPT slides. Thank you Laura and Annette for representing North Carolina and for sharing this important work with our national colleagues and partners! 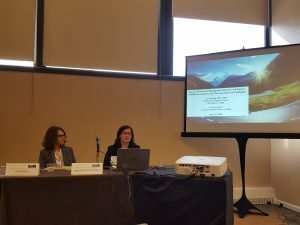 Title: Road to Diabetes Self-Management Education and Support (DSMES) Accreditation: Our Path, Successes and Challenges; and Achieving Medicare Reimbursement to Sustain CDSME Programs: A Road Worth Traveling at the National Council on Aging’s Annual Conference on Healthy Aging in Washington DC. Presenters: Laura Plunkett, Piedmont Triad Area Agency on Aging. Annette Demeny, Centralina Area Agency on Aging. “Achieving Medicare Reimbursement to Sustain CDSME Programs: A Road Worth Traveling”.